The above is a draft Limited Liability Company Agreement of a special purpose vehicle designed to house the shares (the “Shares”) of stock in a private company in the U.S. (“Newco”). The Shares are being purchased by investors rounded up by an individual or firm, labeled for this purpose the “Chaperone.” The vehicle (the “SPV”) is a Delaware limited liability company which operates under the general heading of a search or fundless fund although the SPV I have teed up is designed to sit, as it were, on a separate shelf in the search fund category. The core idea is the same. The individual or firm, a/k/a the Chaperone, styles itself as the General Partner/Managing Member of a private equity or venture capital fund; but each investment (the “Portfolio Investment”) is owned of record by a single SPV. The Chaperone locates Newco, which is looking for capital, absorbs the terms Newco is offering, including the desired pre-money valuation and, let’s say, freezes the deal in place for 60 days in accordance with a no shop, no solicit clause (plus, of course, an NDA). The Chaperone then rounds up from his or her contact list investors agreeing to subscribe to the amounts necessary, on a collective basis, to purchase the Shares. One or more of the investors agrees to act (informally) as the lead investor (the “Lead”) and, in that capacity, negotiates (with the Chaperone’s assistance as an adviser and, on occasion, as an investor) the terms of the deal, including engaging counsel to help close. Neither the Chaperone or the SPV has custody of the securities, farmed out to a broker or service provider and, of course, neither holds itself out as a broker or receives a conventional brokerage success fee. As the deal closes, we house the Shares in the SPV. The Chaperone calls for contributions to the SPV to pay third party expenses (no fees to the Chaperone) out of the collective pockets of the investors, an annual management fee out of the same pockets and a 20% carried interest when Newco, with the Chaperone’s help and guidance, successfully closes on an exit event. The structure of the typical search fund, thus, resembles that of a conventional venture or private equity fund. The investors contribute cash to the SPV and the SPV then buys the Shares as the record holder … for the benefit of itself, through the carried interest and the investors through their percentage interests based on their capital contributions. The Chaperone pays expenses for the duration of the term … i.e., until the closing on the exit event ,,, with the management fee. As and when the Shares yield a profit … a capital gain presumably … upon the exit event, the carried interest is the Chaperone’s principal reward. My model is different from what I will call the standard model in that it is designed to be as friendly to the investors as possible, meaning that they in fact purchase the Shares, each making the investment decision on his, her or its own and then agree to house the Shares in the SPV so as to empower the Chaperone, now labeled the Managing Member, to curate … or, better, help chaperone … the enterprise to a satisfactory exit event. The model in each case structures the economics for the Managing Member along the lines of the AngelList and FundersClub No-Action Letters … third party expenses paid on organization (happily including the legal expenses); and the Managing Member’s profit is in the carried interest … 100% aligned with those of the investors. In my model, the investors are more hands on. They are beneficial owners of the Shares … the SPV is the record owner; their information rights are expanded and, indeed, their powers as well because they are the beneficial owners of the Shares, not the SPV itself. Presumably, they include institutions with an interest in functioning as active investors rather than passive. Thus, they (or at least some of them) want to stay up to date on the progress of the trip (as I put it) from the embryo to the IPO (or trade sale) in real time. In my version, we eschew an annual call on the investors for the management fee (potentially a nuisance in this case) in favor of the notion of an Expense Reserve which is funded upon organization and is filled up as necessary by fees and reimbursements from the portfolio. The investors do pay the organizational expenses, qualifying as “third party expenses” in the language of the AngelList and FundersClub No-Action Letters. This has required some effort on my part to invent new language and it is for that reason the model is being circulated for (I hope and trust) ample edits, comments and assistance in improving an agreement which tracks back, forth, up and down and sideways. The good news is that, assuming this structure gets the job done from the point of view of both the Chaperone and the investors, it serves two functions by navigating between the classic rock and the hard place. On the one hand, it avoids, courtesy of the No-Action Letters, necessity for the Chaperone/Managing Member to register as a broker dealer and to join FINRA and, on the other hand, to run the risks which are inherent in the current broker dealer avoidance strategy… stretching the success fee over a long term “consulting” arrangement. In the latter case, one risk, of course, is that the arrangement is too cute by half … the consulting services are not real and the arrangement is vulnerable accordingly. On the other hand, when an individual (vs. McKinsey) signs up as a consultant, the deal may run afoul of Federal law (and, indeed, some quite stiff State laws), on the status of parties who should be described, because of the nature of their functions and compensation, as employees but who nonetheless style themselves as independent contractors. And, since the contract may “qualify as deferred compensation” it may run up against IRC 409A. Hence, I tee up my version of the Search SPV and invite one and all to point out glitches and to suggest even better ways for helping activate the Conveyor Belt by empowering Chaperones to rise above strangulation by regulation. To qualify as a Venture Capital Adviser, an individual or firm must (a) provide services exclusively to one or more “venture capital funds” which are neither registered investment companies nor business development companies and which pursue a venture capital strategy; (b) provide no redemption rights except under extraordinary circumstances; (c) hold at least 80% of its assets in ”qualifying investments” – equity securities acquired directly from issuers other than in LBO transactions; and (d) limit leverage to 120 days and 15% of assets (including committed capital). Both Venture Capital Advisers and private fund advisers with less than $150 million in AUM are considered “Exempt Reporting Advisers.” An Exempt Reporting Adviser (“ERA”) is required to complete, and file certain items in Part 1A of Form ADV. ERAs are not, however, required to complete any other portions of Form ADV absent a state mandated requirement where a state filing or registration requirement may apply. Information provided in Form ADV must be updated at least annually and “promptly” as changes occur. Venture Capital Advisers remain subject to the antifraud provisions of Section 206 and the “pay-to-play” restrictions of Rule 206(4)-5. Moreover, in order to qualify for exemption under New York law, the Chaperone is required to limit its activities to five or fewer SPVs at any time … a sensible limitation given the amount of elbow grease the Chaperone’s personnel should put into the process of helping chaperone each company to a profitable exit. As indicated, the Chaperone may engage a service provider, RIAinabox for example, to handle the compliance and reporting functions. History: In the early Greylock LPAs, the entire committed capital was called on organization (before the IRR emphasis on the time value of money), and expenses were paid from the interest on the yet-to-be committed funds. FYI, Bill Elfers, Greylock’s founder, created the 20% carry, borrowing it from the oil and gas industry … the wildcatters’ percentage. Clerical and secretarial services at Newco entailed in opining and maintaining the files, forwarding tax returns, etc. Bartlett, “From the Embryo to the IPO, Courtesy of the Conveyor Belt (Plus a Tax-Efficient Alternative to the Carried Interest) “ The Journal of Private Equity Winter 2011, Copyright (c) 2011, Institutional Investor, Inc.
 As set forth in Section 203(1)-1(c)(3): Qualifying investment means directly acquired investments in equity securities of private companies (generally, companies that at the time of investment have not made a public offering) and that do not incur leverage or borrow in connection with the venture capital fund investment and distribute proceeds of such borrowing to the fund (i.e., have not been acquired in a leveraged buy-out transaction). Wholly owned subsidiaries and similar controlled structures customary in venture capital vehicles will also be considered Qualifying investments. See, IM Guidance Update 2013-13 (December 2013). (Note that the 20% bucket excludes cash and certain short-term holdings). The term “Exempt Reporting Advisers” is used throughout the instructions to Form ADV and was first used in the SEC release adopting rules 203(l)-1 (Venture Capital Fund Defined), 203(m)-1 (Private Fund Adviser Exemption) and 202(a)(30)-1 (Foreign Private Advisers) (Release No. IA-3222, June 22, 2011) at page 6. Venture Capital Advisers that are not registered or required to be registered under Section 203 of the IAA are not subject to Rule 206(4)-2 (the “Custody Rule”). Tel Aviv, January 14, 2015. In 2014, 12 Israeli venture capital funds raised $914 million, the most raised by Israeli venture capital funds in six years. The year’s fund raising was up 68 percent from the $544 million raised by 11 VC funds in 2013, and was 18 percent above the 10-year average of $777 million. Four veteran Israeli VC funds managed to raise more than $100 million each and accounted for 64 percent of total capital raised in 2014. Carmel Ventures’ fourth fund attracted the largest amount – $194 million, while Magma raised $150 million for its fourth fund, less than two years after closing its previous $110 million fund. JVP made a first closing of $160 million of a targeted $180 million for its seventh fund. 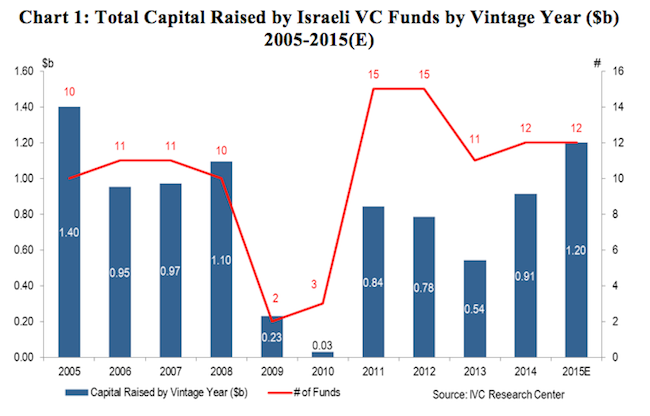 In addition, Vintage’s seventh fund, a fund of funds, attracted $144 million, 50 percent of which is being allocated to Israeli investments. The average fund size in 2014 reached $76 million, 55 percent above 2013’s $49 million average, and up 46 percent from the $52 million of 2012. The increase reflects the raising of more medium sized funds and fewer micro VC funds than in each of the previous two years.